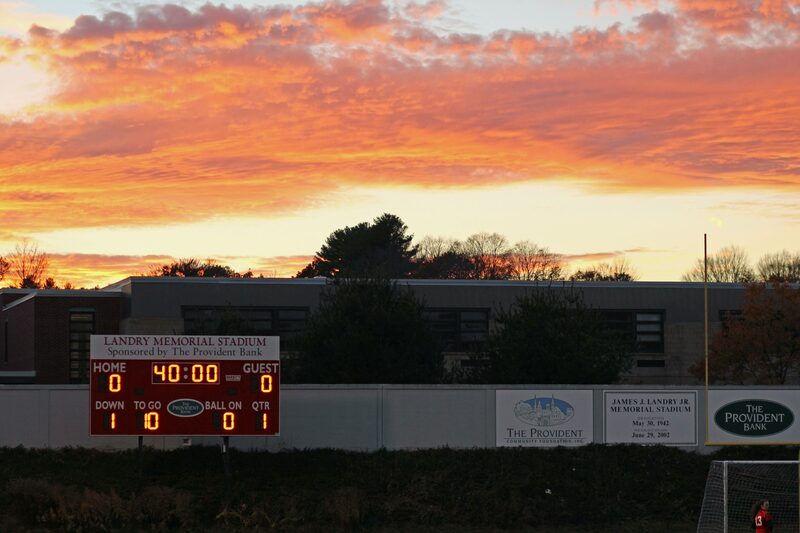 (Amesbury MA) Amesbury pressured visiting Innovation Academy from start to finish and won their Division 4 First Round game, 6-0, on Friday night at Landry Stadium. The #6 seed Indians (10-4-5) will play #3 seed Matignon next on Monday. 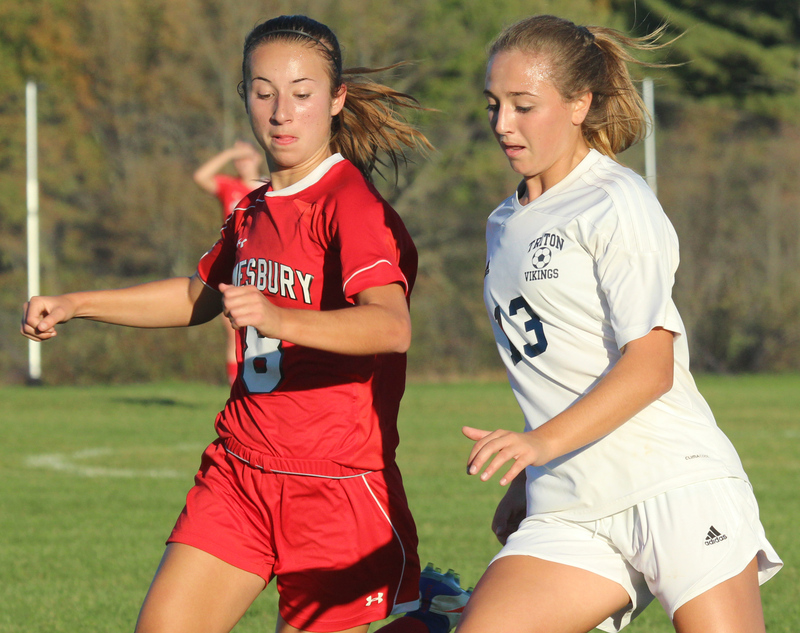 Amesbury racked up three goals in the first half and substitute Schuyler Snay had assists in two of them. In both cases, Schuyler sped along the right sideline before finding teammates Chelsea Lynch and Maia Etsy in the middle. After two point-blank shots by the Lynch cousins (Mollie and Chelsea) it was Mollie who converted a rebound to open the Amesbury scoring at 19:58. 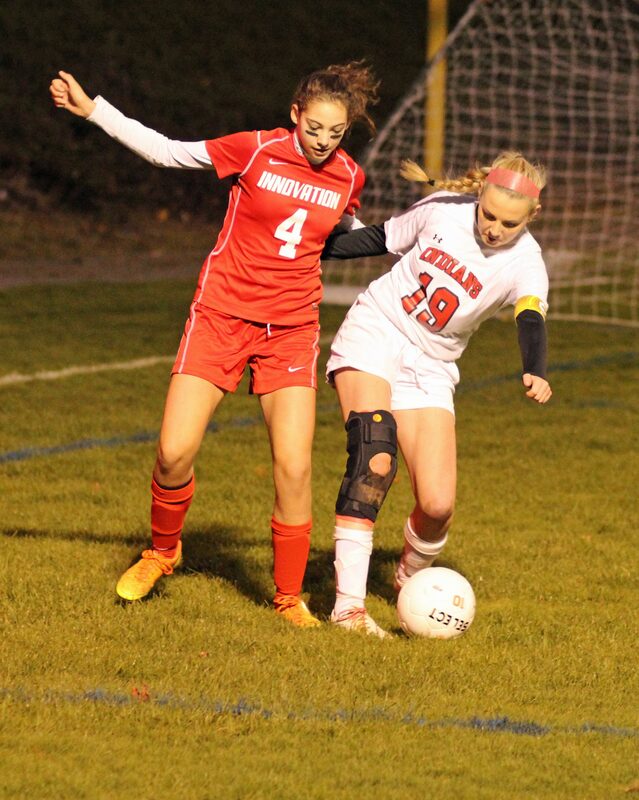 Michaela Halloran had a goal disallowed for colliding with Innovation goalie Melissa Fonseca late in the first half. My photos would suggest otherwise. Less than two minutes into the second half sophomore Ashley Pettet tallied a low bullet from the left. Ashley was the best player on the field from where I was watching. 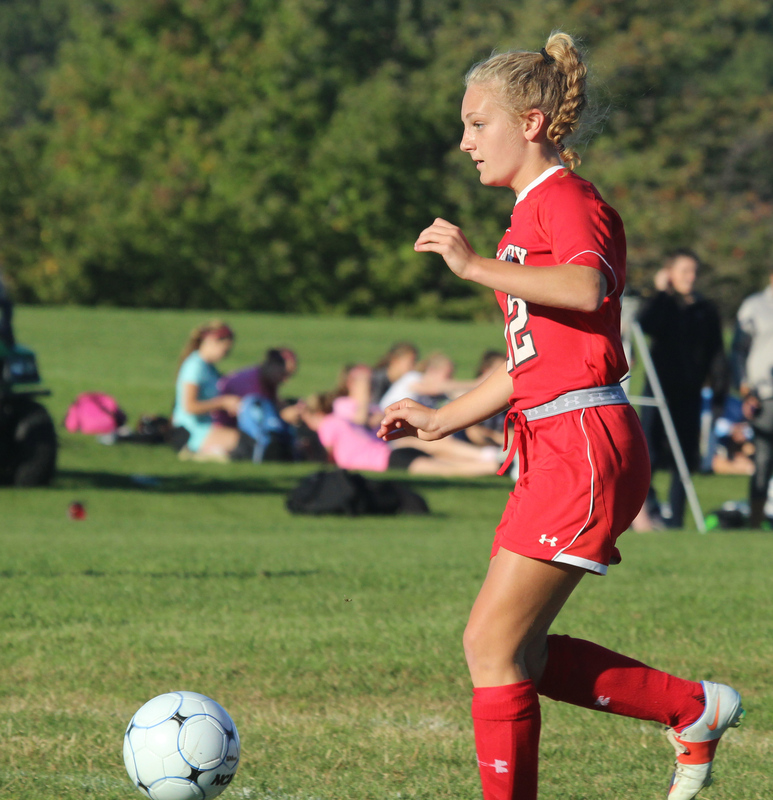 She constantly created space for herself and found teammates with excellent passes. 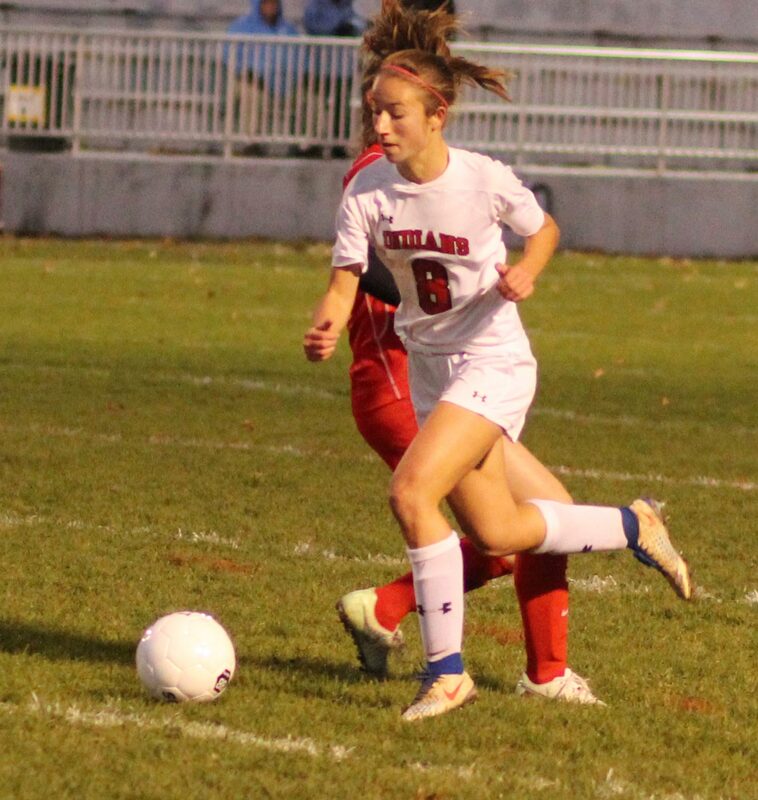 Emma Richardson finished off a Mikayla Porcaro throw-in to collect the 5th Indians goal. 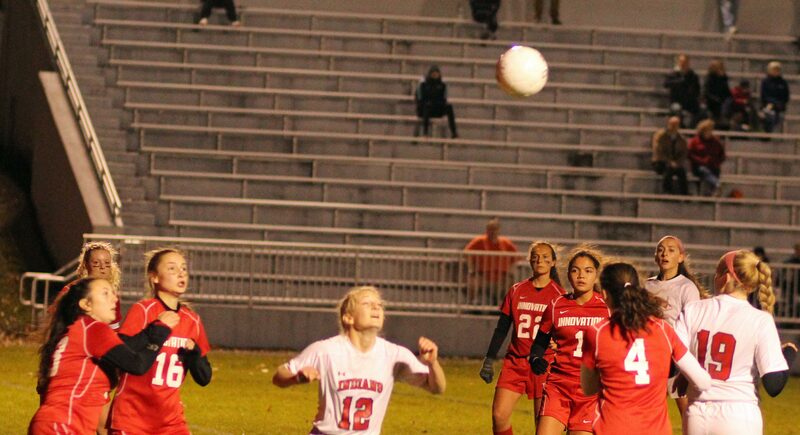 Two plus minutes later freshman Sophia Carter used a strong left foot the garner the home team’s final goal. 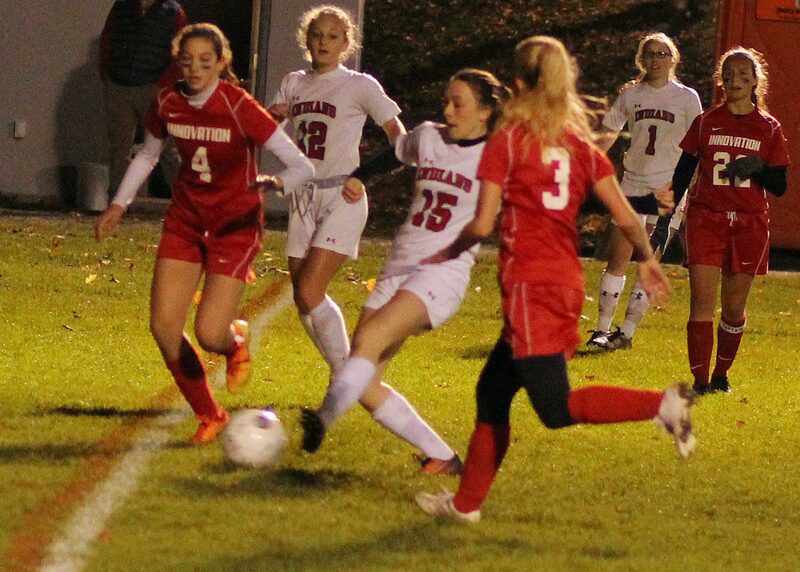 The Hawks of Tyngsboro (8-6-5) had plenty of speed but couldn’t get any sort of passing attack in motion. 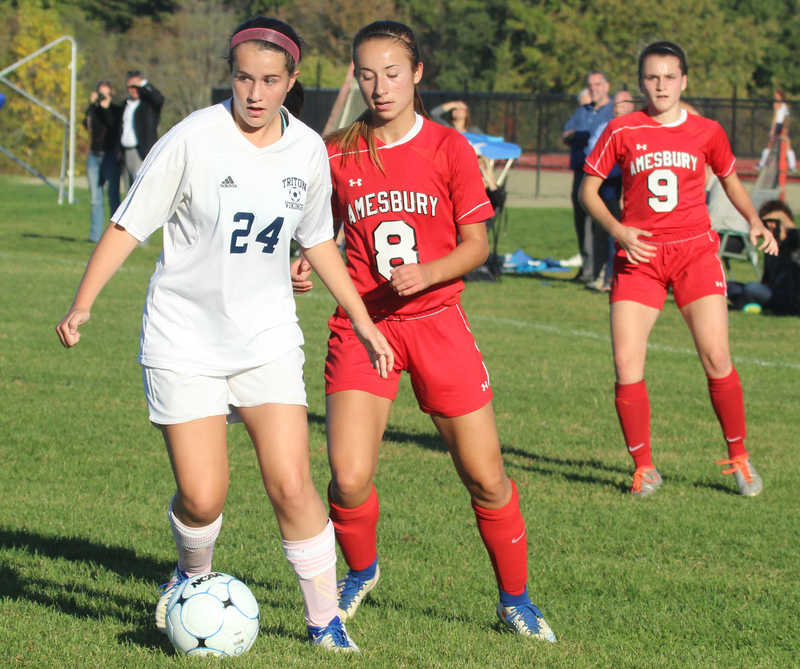 Good Amesbury defense led by Emma DiPietro, Hannaih Burdick, and Mikayla Porcaro spelled the difference. No question that Mikayla Porcaro’s long throw-ins created problem in front of the Innovation goal. 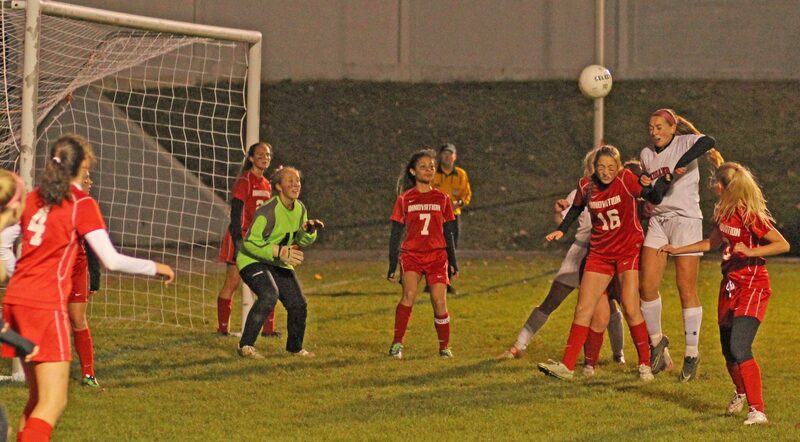 Ashley Pettet had some very dangerous corner kicks for the Indians. Plenty of students on hand supporting the AHS girls soccer team. I knew that identifying Innovation players would be an adventure when the game program had their names without numbers. I also discovered that the MIAA roster for the team was inaccurate. Surprised that there were no announcements about the specifics of each goal. 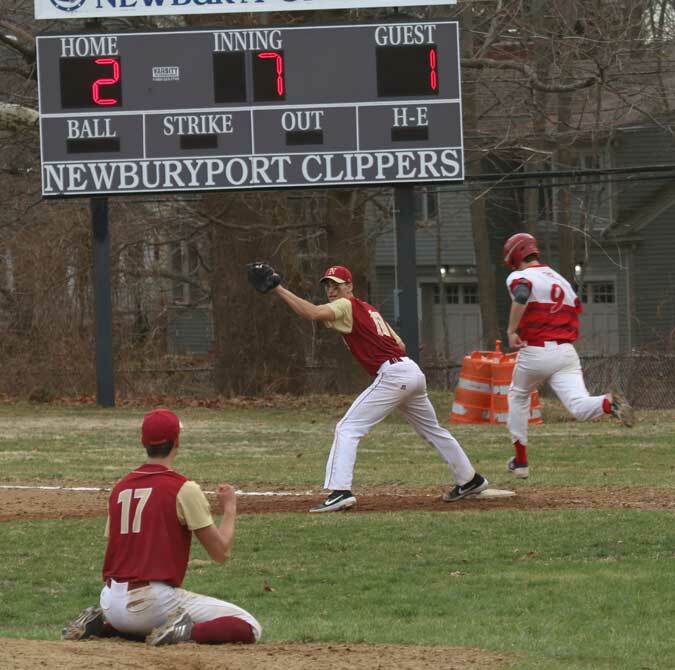 (Byfield MA) Amesbury ended a two week, win drought with a 2-1 Cape Ann League victory against Triton on a sunny Thursday afternoon. 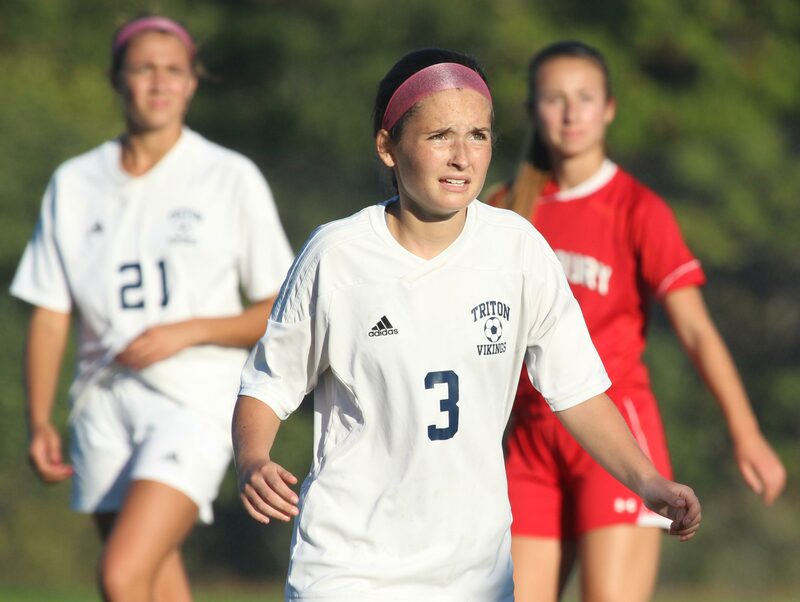 The Indians (4-2-4) used a second-half score (see above) by senior Emma Richardson to get the job done. Triton (2-6-1) played well enough to win but, thanks to a solid Indians defense, were limited to long shots for most of the afternoon. 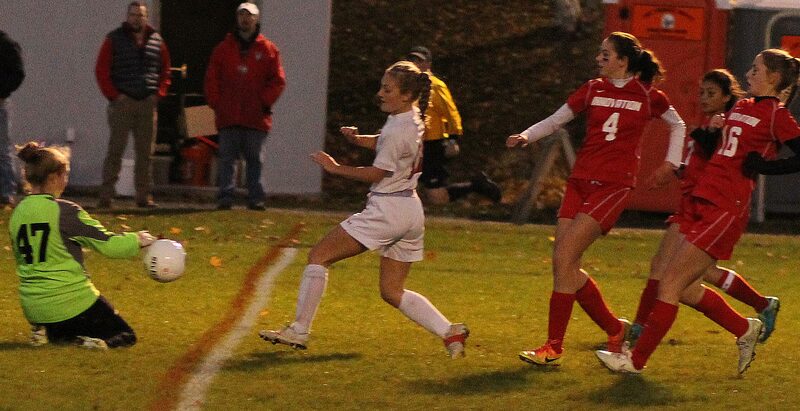 Junior Meredith Kennedy drilled home one of those long shots for the Vikings that led to a 1-1 halftime tie. Amesbury arrived late (to Triton) but started fast. Sophomore Chelsea Lynch broke in very early with pregame space and time to dribble closer, look up, fire, and score. At that point I suspected that Triton might be in for a long afternoon. But it wasn’t that way at all. 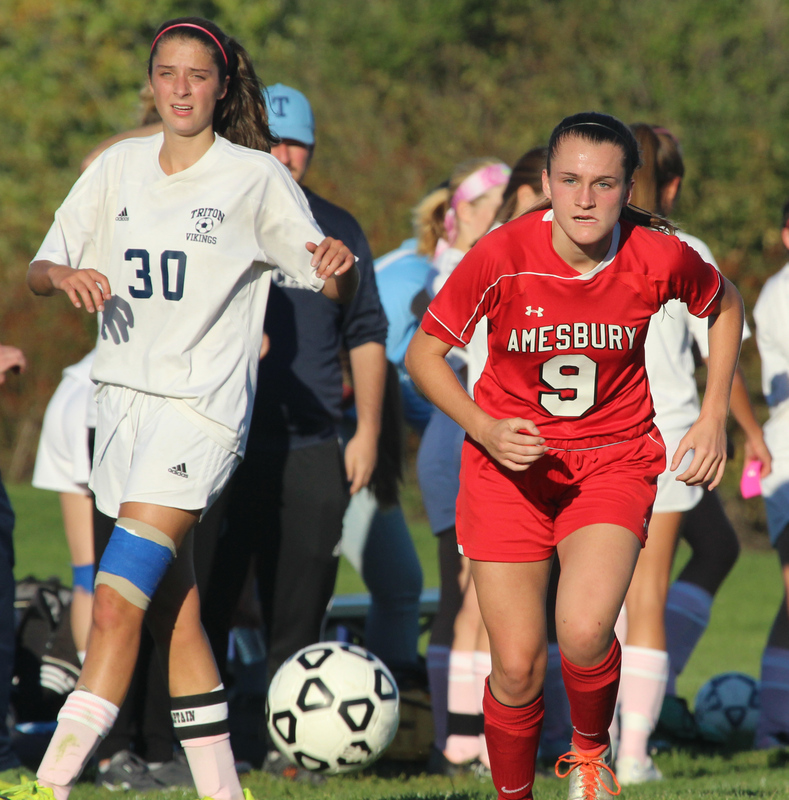 The Vikings defense tightened up considerably and Amesbury chances were few. On the other hand, Triton made runs down the sidelines on several occasions. Junior Meredith Kennedy made one of those runs down the left sideline midway through the first half. 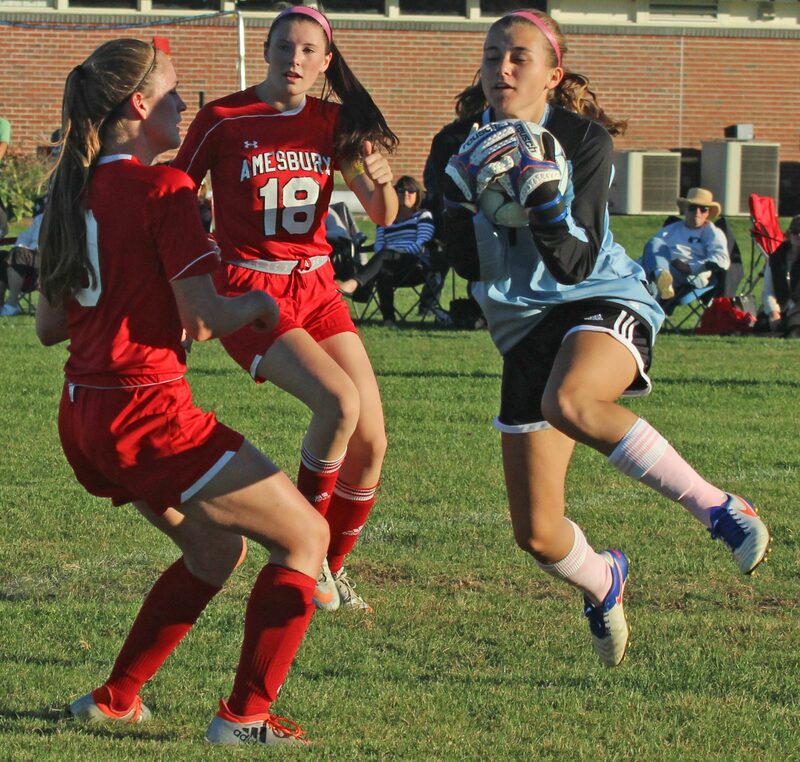 Meredith’s left-footed shot sailed over Amesbury goalie Alli Napoli to tie things. Second half? 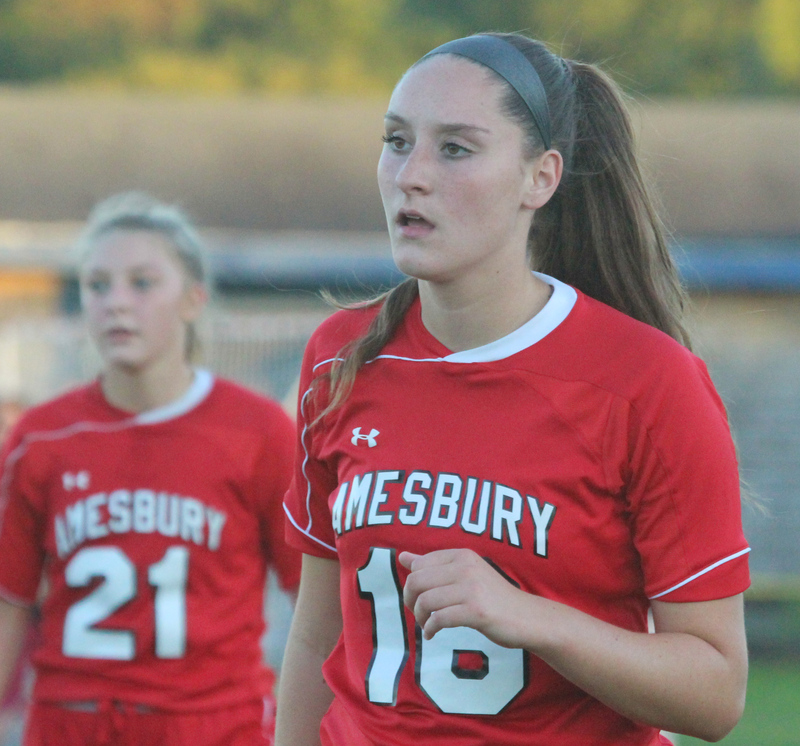 Amesbury had chances. Triton had chances. 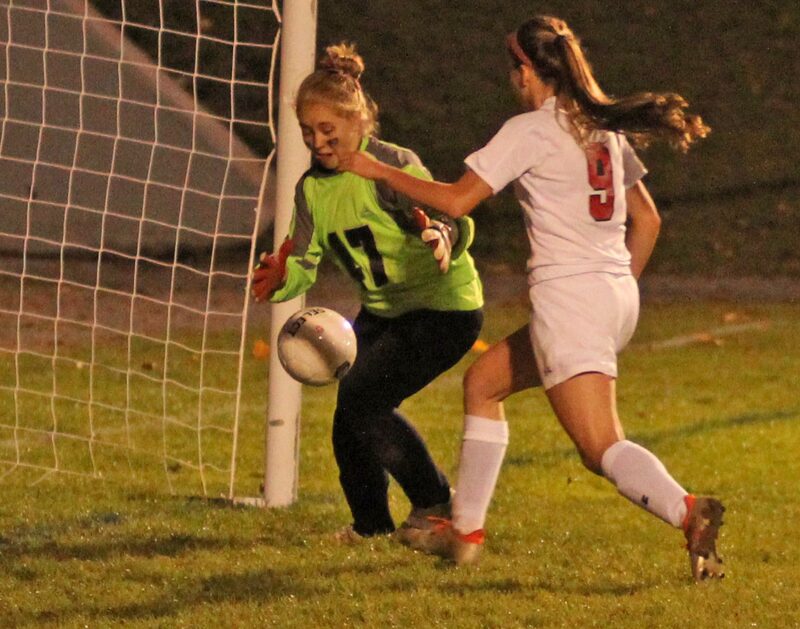 The Indians got in real close a number of times but senior Triton GK Dayna Rybicki had answers. 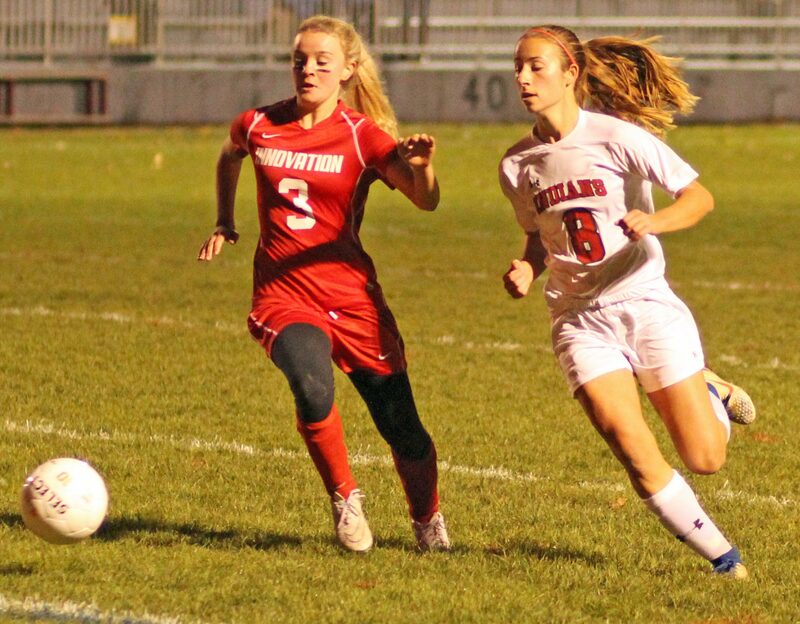 The Vikings had shots on net and several corner kicks but AHS senior defenders Julia LaMontagne and Mikayla Porcaro helped keep things long range. 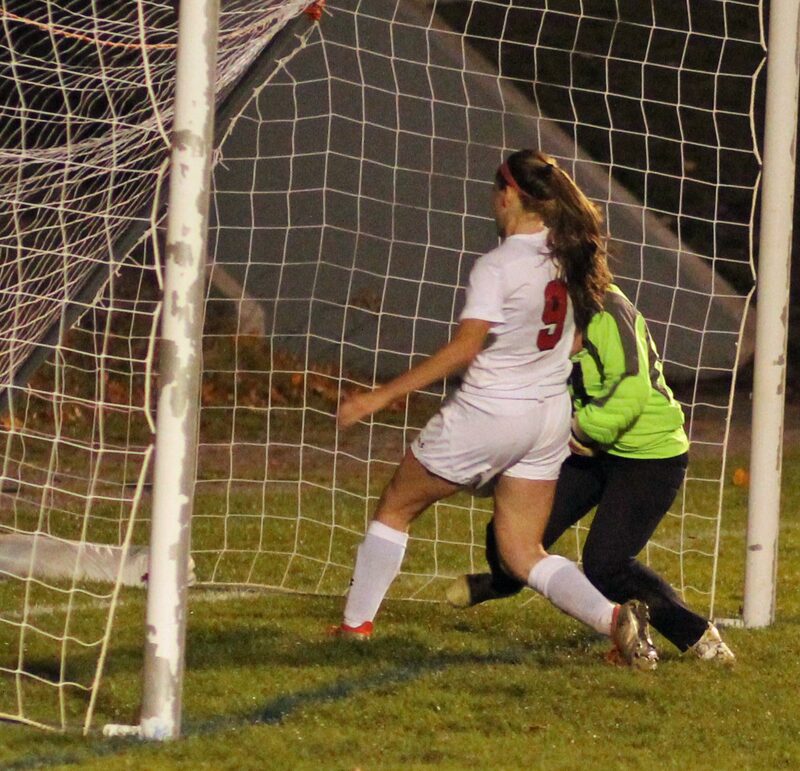 Emma Richardson registered the game-winner midway through the second half. 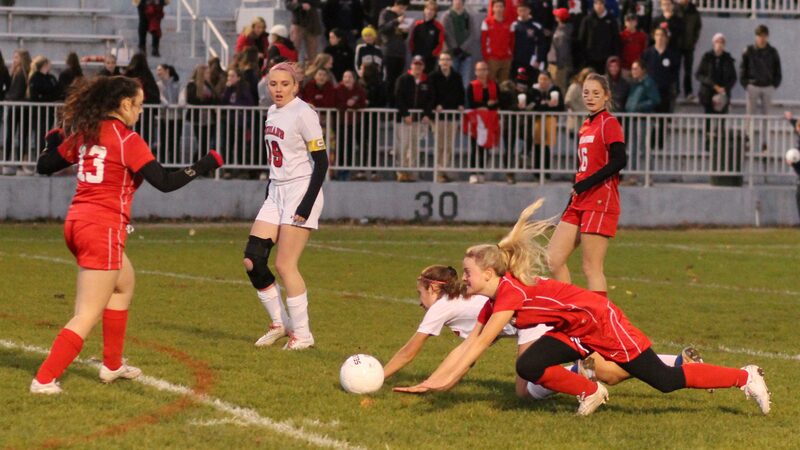 The senior took a feed from teammate Emma DiPietro and raced down the right sideline. As Emma cut toward the net she lifted a shot over Dayna Rybicki. Impressed with Meredith & Alex Kennedy. Both are returning CAL All-Stars. Defender Apphia Donoghue was very good handling AHS pressure. 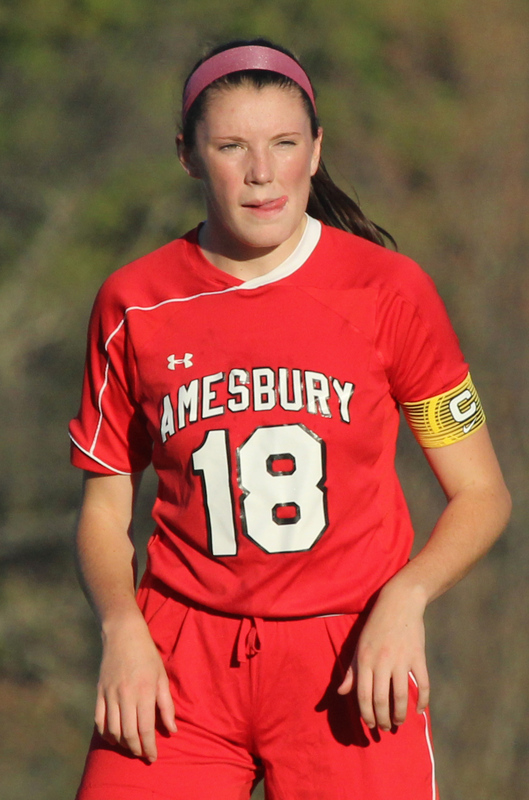 Another returning CAL All-Star, Ashley Pettet, did a nice job passing and defending for Amesbury in the midfield area. 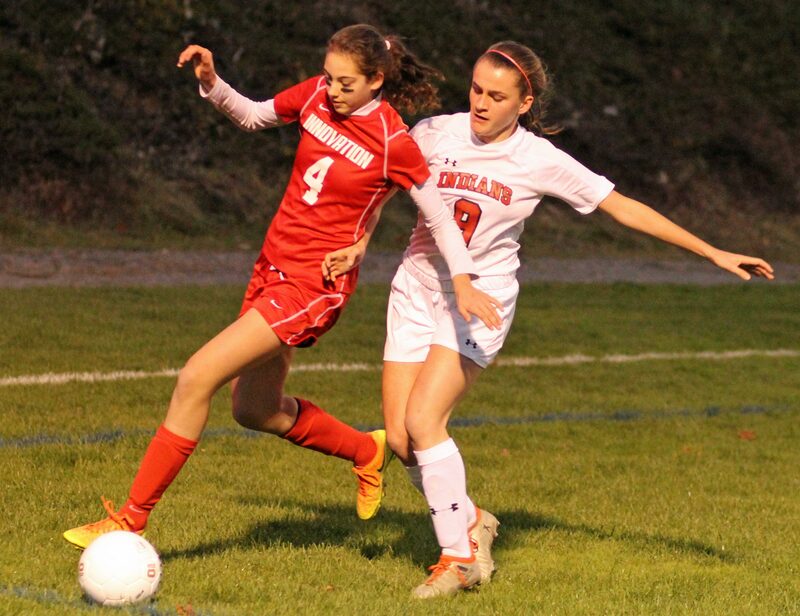 Senior Mikayla Porcaro was the ideal defender in front of AHS freshman goalie Alli Napoli. Tall and experienced (Bishop Fenwick), Mikayla cleared numerous Triton attempts before they reached the AHS net minder. 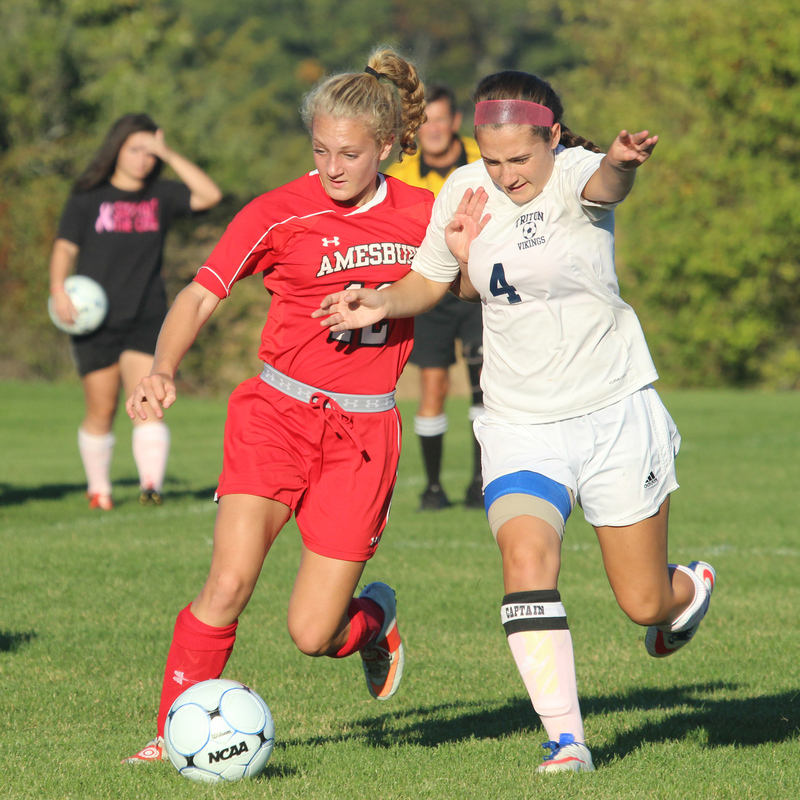 Next for Amesbury is a game tomorrow (Friday) at home against seriously depleted Pentucket. Triton will be at Ipswich on the same afternoon. AHS has now scored ten goals in ten games while giving up seven goals. 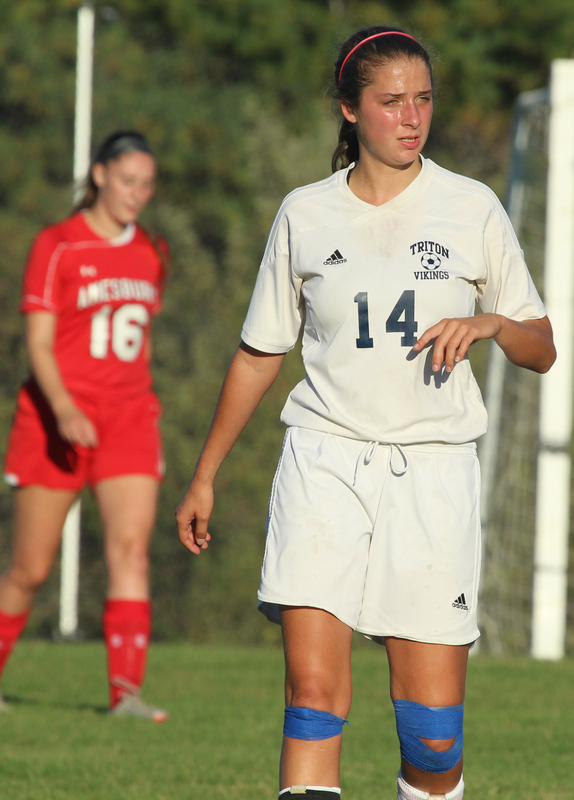 Triton has tallied seven goals in nine games while giving up twenty-eight goals. I have no doubt that the Vikings defense I saw this afternoon is a whole lot better than it was earlier in the season! 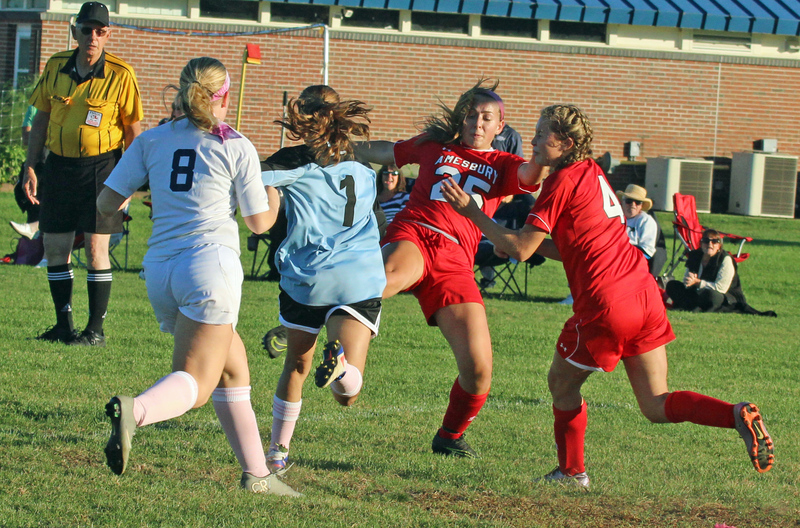 Instead of punting the ball out, Alli Napoli often passed the ball toward the sidelines. That strategy led to several quick Triton counter-attacks. Sara Stackpole was on the sidelines for Triton.